There is always something to do at home and something to fix. Sure, you can spend hundreds of dollars to get these tasks done, but you’re savvier than that. Plus, there is no fun in just replacing something when you could build it with your own two hands. You are probably itching for a new project to tackle, which is only natural for DIY-ers. 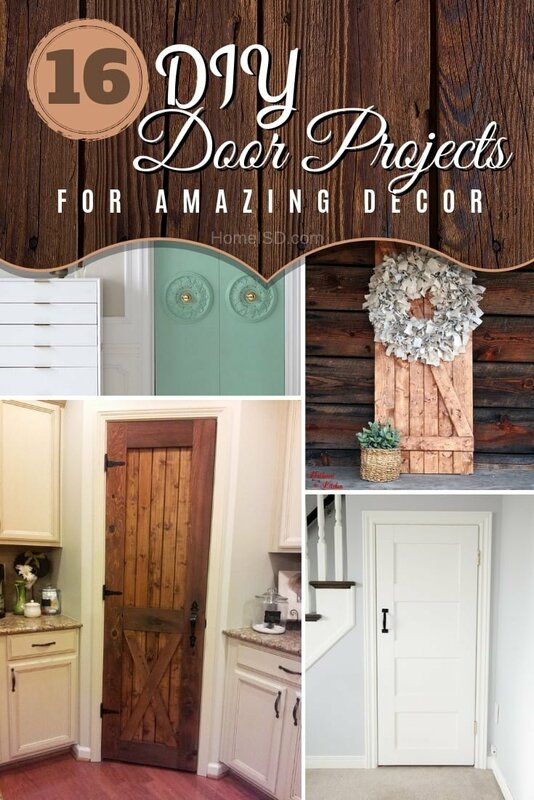 Well, you do not have to worry about your next project because the following are 16 DIY door projects that you can tackle in your spare time. One of the worst kinds of doors is one with no character. You have seen these doors, and they look like plain rectangles, but you can fix this bland door with a couple of plywood strips. It is a pretty easy job, and you will paint over the added wood strips. Everyone wants the opportunity to spice up a door and make it stand out. Well, one way to make your door stand out is to make them into barn doors, which gives your home a nice chic look. All you need is some furring strips and your regular woodworking tools along with 30 minutes of your time to finish this project. Pantry doors can be pretty boring, especially after staring at them for some time. Do not worry, everyone wants a change sooner or later, and doing this yourself is the best way to go. Use your old pantry door as a guide to make this rustic pantry door using a couple of cedar wood pieces. Bi-fold closet doors can be plain or they can be made to look quite stylish, and you know what you want. All you need is some plywood and some wood strips to make these bi-fold paneled closet doors along with your woodworking material. Be careful what color you choose unless you’re going to paint the entire closet one color. Those who are looking for a little privacy and want the beauty of a dutch barn door should consider this project. Kids only get access behind the door when you allow it, but you can still have the door open. All you need is some plywood and a willing spirit. You can update your closets and make them look like a million bucks if you invest a little time. Now, the key to this specific makeover, besides the woodwork, is the paint. You want a smooth finish, meaning you need to give the wood a flawless surface using DAP Plastic Wood and sandpaper before painting. You are not the only one with a closet or space that has no door. Sometimes, it is hard to get around to fixing the issue, but this simple solution should make everything worthwhile. What you can do is re-purpose an old plumbing pipe and attach a door. Make sure you sand and prime the door. Everyone has seen a sliding door, but a DIY door on a track like this one is both rustic and industrial. All you need to do is install your track, and find yourself an antique door that you are going to place on the track, and you are done. Face it, there are times when you need a gate. Maybe you need to keep kids out or maybe you need to keep your dogs out without taking your eyes off of them, but the point is a gate is useful. The problem is that gates are eyesores, which makes this easy dutch door DIY project perfect. All you have to do is cut your old door, and use a small pine board to create that clean break. Creating this beautiful door does not take more than a little imagination, some paint, your old closet door, and a beautifully designed ceiling medallion. The idea is to make it seem like the closet door’s handle was placed in the middle of the medallion. It will spice up your door, making it look quite elegant. Some people love the look of the rustic door but others prefer the beauty of a finished barn door like this one, especially because this one only uses one sheet of cabinet grade plywood. This is a sliding door that uses a track, but it is easy to put up, so it should not take too much of your day. One sliding door is nice but two really make you feel like the master of your domain, especially knowing that it is your own handy work. The steps are straightforward, using strong wood pieces. You are going to need to install a track to complete the project, but it is going to be worth it. Screen doors add character and give a home the freedom to enjoy nature without all the buzzing invading your home. This screen door is pretty easy to make, requiring a few pieces of wood and a screen. The color used for this project is a bold lime green, though it is really up to you. Making a plain old door seem like a vintage five panel door is not too hard. What you need to do is figure out the dimensions of your plain door and get some wood pieces to fit this door. Place them over your door, and sand everything down for a smooth look. Finally, you want to stain every bit of it to make it look like a vintage door, which should give your home a great look. Door trims can be easily overlooked unless you decide to commit to a bold look with thick, door trims. Now, you are going to have to use a crowbar to remove the old trim, and then move on to cutting a few 1 by 4’s to match the dimensions of your door frame. It is not too hard, and it is going to look amazing. Be sure to use a color that matches your door. Another way to add architectural interest to a room and make it look more classy is to add crown molding trim around doors. It’s very easy to do.